MARINETTE, Wis., Feb. 6, 2019 /PRNewswire/ — Lockheed Martin (NYSE: LMT) and Fincantieri Marinette Marine (FMM) delivered another Littoral Combat Ship, the future USS Billings (LCS 15) to the U.S. Navy. 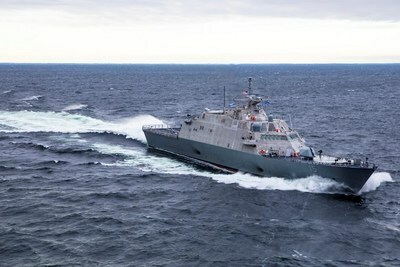 Unique among combat ships, LCS is designed to complete close-to-shore missions and is a growing and relevant part of the Navy’s fleet. It is flexible — with 40 percent of the hull easily reconfigurable, integrating capabilities like the Longbow Hellfire Missiles, 30mm guns, and manned and unmanned vehicles targeted to meet today’s and tomorrow’s missions. For more information, visit www.lockheedmartin.com/lcs. Fincantieri is the leading western shipbuilder with a rich history dating back more than 230 years, and a track record of building more than 7,000 ships. Fincantieri Marine Group is the American subsidiary of Fincantieri, and operates three Great Lakes Shipyards: Fincantieri Marinette Marine, Fincantieri Bay Shipbuilding, and Fincantieri ACE Marine. Fincantieri Marine Group’s more than 2,100 steelworkers, craftsman, engineers and technicians in the United States specialize in the design, construction and maintenance of merchant ships and government vessels, including for the United States Navy and Coast Guard.